I am currently in Australia where I am meeting a lot of interesting people, my family, some good friends and last but not least the Queensland Minister for Main Roads, Road Safety and Ports, who is also Minister for Energy, Biofuels and Water Supply; the honourable Mark Bailey MP. It is a good thing that this is again the none short post week, because I have been too busy preparing everything for this Australia trip to write a longer post. For those of you who do not follow me on Twitter I will explain a bit what I am doing in Australia. Last year I gave a presentation for the Summer Course of the Amsterdam University in Zwolle. In the audience was PerthBiker who asked me if I would be willing to do that same presentation in Perth. I said yes and sure enough, here I am on an Australian tour. First up was Brisbane where I have relatives. I spent a nice weekend with them and last Monday, 20 March, I started the real work. 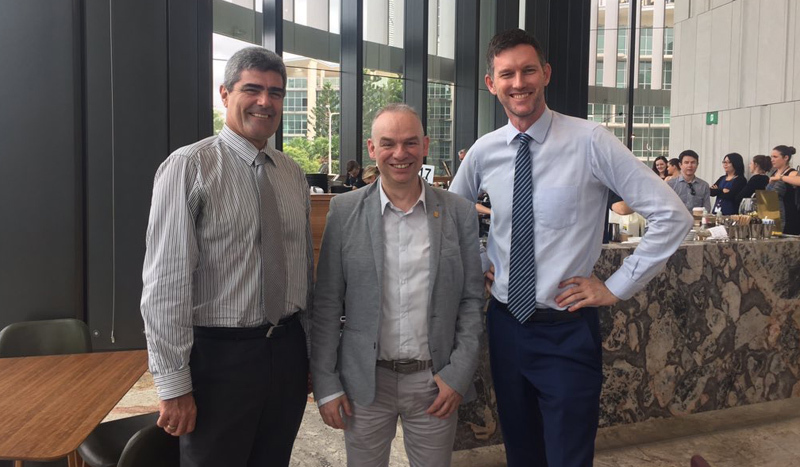 The day was organised by Adam Rogers and opened with a talk over coffee with the Queensland minister for Transport, Mark Bailey, who is an avid cyclist himself. In the Australian fashion, so we would call him a ‘wheel runner’. The talk lasted a bit longer than planned and we had a very nice conversation. 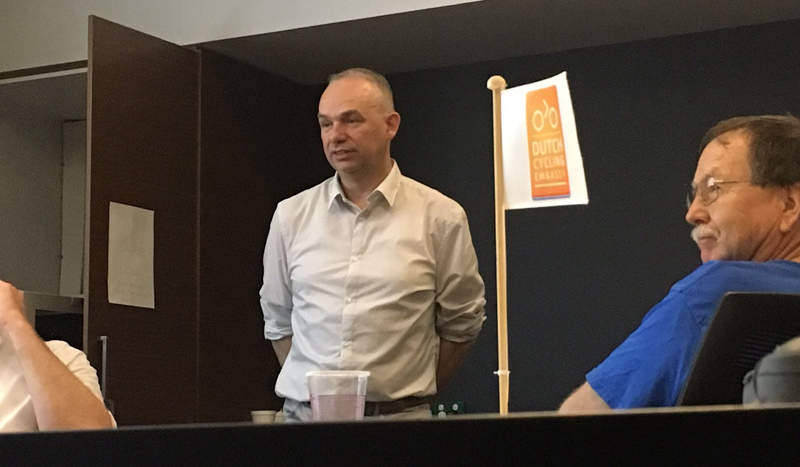 I must admit I never directly talked to such a high-ranking official, before, but being the Bicycle Ambassador of the Dutch Cycling Embassy does open doors. It was a bit intimidating, but I told him that he shouldn’t dismiss advocates who ‘glorify’ Dutch cycling and protected cycling infrastructure, because I feel he couldn’t take his self – a younger able man – as the measure of things. It is a different story for elderly people and women, particularly mothers who would like to ride. He seemed very focused and open to my suggestions. He immediately discussed an interesting plan for a street in the city center. But he has all sorts of parties to take into account, not least the city council, so it is uncertain if and when such plans materialise. The minister later tweeted he had a great chat with me. At lunch time, I gave a presentation for people of the Department of Transport and Main Roads that was well visited. In the afternoon we had planned to cycle around in Brisbane to see some infrastructure that I would comment on. Being a guest of the government I had no other option but to adhere to the law (it would go too far to say I “respect” it) and for the very first time in my life I had to wear the silly plastic hat! Luckily, Brisbane’s shared bicycle system has some really dorky complementary helmets and I got to wear one of those. A historic moment that was photographed, but that should in no way imply I changed my stance on helmets. Unfortunately, it was raining cats and dogs for a long time, so the bike ride had to be cut short and I didn’t get to see the newest infrastructure in Brisbane. Some other time perhaps. 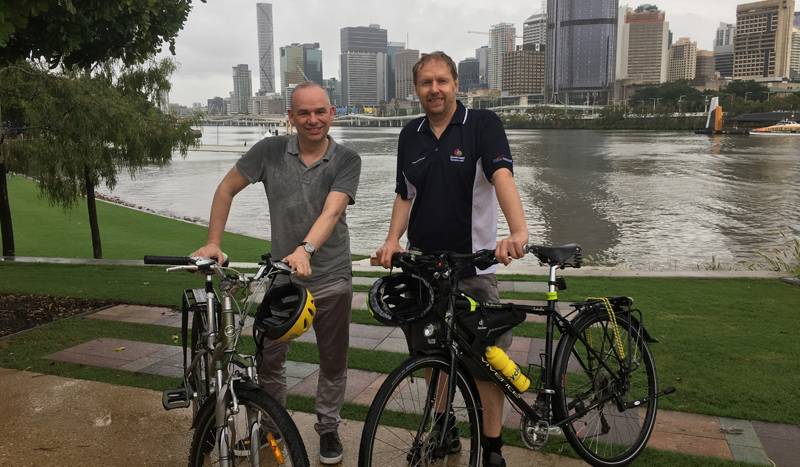 Soaking wet at the Brisbane river (I felt right at home) with Adam Rogers who organised this part of my Australian tour. In the evening I repeated the presentation for a different group of people; transport professionals united in the BikePedTrans organisation. The response was very enthusiastic, so I had a great first day! Tomorrow I will fly to Canberra for the next leg of the trip. Wednesday I fly on to Perth for the conclusion. Presenting for the members of the BikePedTrans organisation. Note the flag of the Dutch Cycling Embassy which I also represent on this trip (picture by Shaun Moran). Meanwhile in ’s-Hertogenbosch (and this completely unrelated) people keep using the bicycle parking facility at central station. I made a short video right before I went to Australia and I would like to share that with you now. Entrance to the ’s-Hertogenbosch bicycle parking facility. Pingback: Can Sydney Go Dutch? A little event called CicLAvia occurred last Sunday.from Culver City to Venice Beach which is among the highest amount of bicycling in LA county. The potential for bicycling in the LA area is enormous. Bicycling is about to explode in the city of Los Angeles. Currently there is about $10 million that is spent for bicycling infrastructure annually in LA. I doubt that there is another city in the U.S. that has ever spent this much annually on bicycle infrastructure. Hi Dennis, good news so. However how much $ per inhabitant per year will that be for LA? And which part of those millions will be spent to change / reconstruct junctions and crossings in stead of kilometers cycle paths / lanes? Its about $5 per inhabitant. Only about 1% of the adult population takes a trip by bicycle. I’ve been using a bicycle for my main form of transportation for many years. I have bicycled extensively in The Netherlands and Belgium. I have recently come to a starting conclusion – bicycling is very dangerous! No matter where! In The Netherland I have seen statistics indicating 1 out of 275 people end up in the hospital every year as a result of single-side bicycle accidents (not including collisions with cars or other cyclists). If this was a disease it would be a major health issue. I look back on my years of cycling and I have seen and been in cycling accidents. Two nearly cost me my life. In fact in Belgium I have noticed photos of predominantly young men every several kilometers or so on the separated bicycle paths. I guess these are memorials to fallen cyclists at the spot. There are lots of them all over and it’s very sad. On a bicycle you sit at least a meter off the ground. Then when you are moving at even a slow speed a fall from that height can be catastrophic! Falls can happen for any number of reasons. Ice is a main culprit. Wearing helmets, and perhaps other protective gear, and being extremely cautious are the best way to protect ones self. Still, even then it is very dangerous. Don’t get me wrong. I bicycle each and every day and will still continue to do so. I would like to have a world transport culture with no cars! It’s just that now I know if I continue to cycle there is a real risk I may end up with permanent disability or worse sometime in my life. “Great satire”…, what do you mean? Thank you Mark so much for bringing good ideas from the safest cycling country of the Netherlands. I live in Brisbane (near Sandgate) where cycling along the shoreline is a nice possibility. I currently ride without a helmet legally by implementation of the medical exemption but I regularly receive abuse when I encounter the Lycra wearing cycling enthusiasts. It is an interesting psychological experiment on spectators while riding in Queensland without a helmet. My wife and I will be cycling in the Netherlands in June because it’s a great place to enjoy a bike. If you are still in Brisbane, feel free to contact me. I am already in Canberra today and will be in Perth tomorrow! Have a great time in the Netherlands in June! Hi Mark, again thank you for taking the time to speak to our Queensland policy makers. The Minister Mark Bailey is a huge proponent of mandatory helmet laws. Did this issue come up during your discussion or presentation? I ask, in the hope that impartial expertise may get through where local advocacy has failed (I’ve been blocked by the Minister on Twitter for even suggesting reform). How did you get blocked by the minister for reform ideas? Do you work for the ministry? This entry was posted on 21 March 2017 by Bicycle Dutch in Original posts and tagged Australia, ’s-Hertogenbosch (Den Bosch), Brisbane, cycle parking, railwaystations.